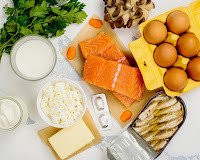 Cholecalciferol, also known as vitamin D3, is the most common dietary form of vitamin D. It can be derived from cod liver oil, cold water fish, butter, and egg yolks. Ergocalciferol, or vitamin D2, is a vegetable source of vitamin D. Although vitamin D3 is the preferred source of vitamin D, consuming portabella and shiitake mushrooms and alfalfa will provide small amounts of vegetarian vitamin D.
The body can produce vitamin D by sunlight coming in contact with the skin. Dietary and supplementary forms of vitamin D are preferred. Vitamin D deficiency can result in osteomalacia in adults and rickets in children. This causes an inability to calcify the bone matrix, resulting in bones that become soft and brittle. Deficiencies are most commonly found in women and elderly people either not getting enough sunlight or not supplementing vitamin D. This will lead to bone loss and joint pain. Vitamin D is best known for insuring the absorption of calcium. The liver stores vitamin D and then uses it as needed. Cholecalciferol is converted in the liver into 25-hydroxycholecalciferol and then into 1,25-dihydroxycholecalciferol, a more potent form of vitamin D, to promote calcium absorption in the bones and calcium re-absorption from the kidneys. Vitamin D is also very important for proper immune function. Many increase their intake for the winter (i.e. cold and flu season). Vitamin D is an essential vitamin, primarily involved in calcium metabolism. Certain drugs like cholestyramine, Dilantin, and phenobarbital can interfere with vitamin D absorption. Some body care products and mineral oil can also interfere with absorption. Vitamin D is also considered a hormone due to sunlight converting into vitamin D through the skin. By correct definition vitamin D is both an oil soluble vitamin and hormone.